If you’re keen to get involved in community planning for Suisun City, you might want to join an upcoming workshop at the Joe Nelson Community Center on May 1st, 2019 from 6:30 PM to 8:30 PM. 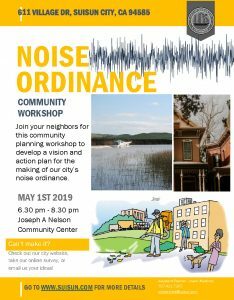 The workshop is hosted by the Suisun City Planning Division and the Suisun City Police Department — this workshop will identify concerns and opportunities for improvement in the noise ordinance, and organize community discussions and feedback. We will provide the agenda and information about the event a week beforehand. We will have Spanish translators at the workshop to assist. The 2019 schedule of Community Drop-Off Days has been finalized as April 13, June 8, August 10 and October 12. “We can’t fix what we don’t know about.”“We don’t know what we haven’t been told.”These types of adages serve us just as well in our modern, electronic, social media-driven, mile-a-second world as they did in our grandparents’ day. The Police Department is proud to announce that it is now accepting applications for entry-level Police Officers. This position is designed to identify the very best candidates and develop them into Suisun City Police Officers.